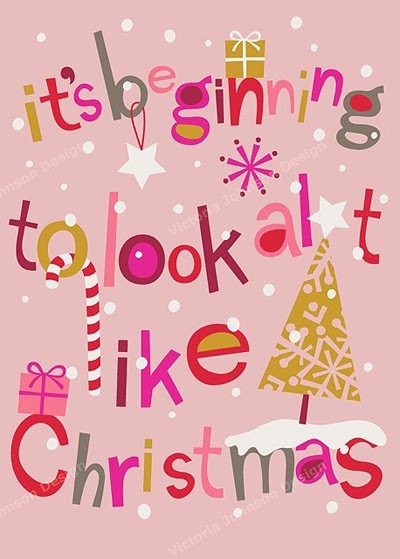 Funoldhag: The First of December---Already! Thanksgiving has come and gone - and it was a very nice day with Sher and Barc. Even though there were just the three of us this year, it was still great. My daughter and I are good cooks!! We had a yummy meal, some nice wine, a fire in the fireplace (gas logs!) and she and I worked on a jigsaw puzzle which we finished Friday evening when they came back for leftovers. Barclay watched football games on my new tv. Also, there was facetime with all three girls and a phone call from Bill. A good day, for sure. 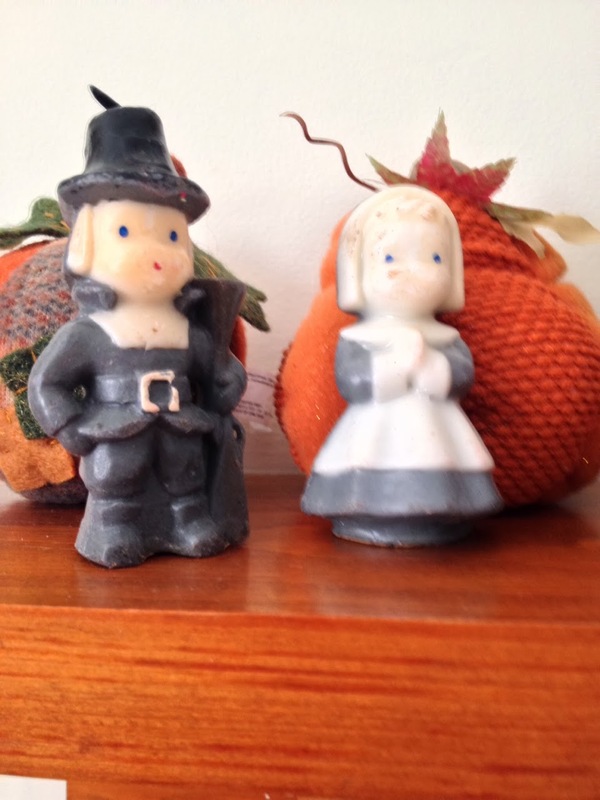 To explain the rather faded little pilgrim candles - those are really vintage. One is marked 10 cents and they are somewhere around maybe 30 to 40 years old. I have some Christmas candles of the same ilk. Earlier, I had a text with this picture attached. 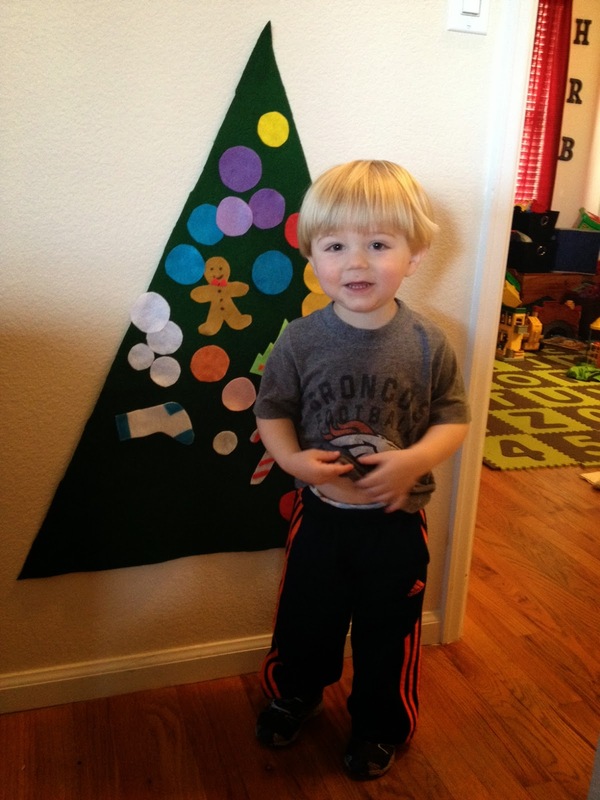 Here is Henry with the tree I sent to him. His mommy said he really likes it. Henry is as cute as a button and getting cuter all the time. This will be a big year for him this Christmas. Little ones make Christmas so much fun. Isn't this just adorable? 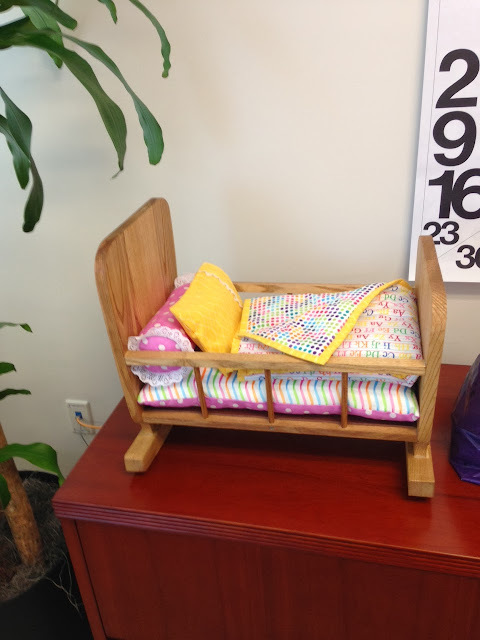 My DIL Ann had this made as a gift from Bill and her for Annie. When they were here in August, she "shopped" in my basement for fabrics for the bedding which she also had someone make. What a wonderful gift! And it is something that can certainly be passed down to other little ones over the years. If you remember from an earlier post, Annie's daddy made her a table and chairs so this will go so well with those. 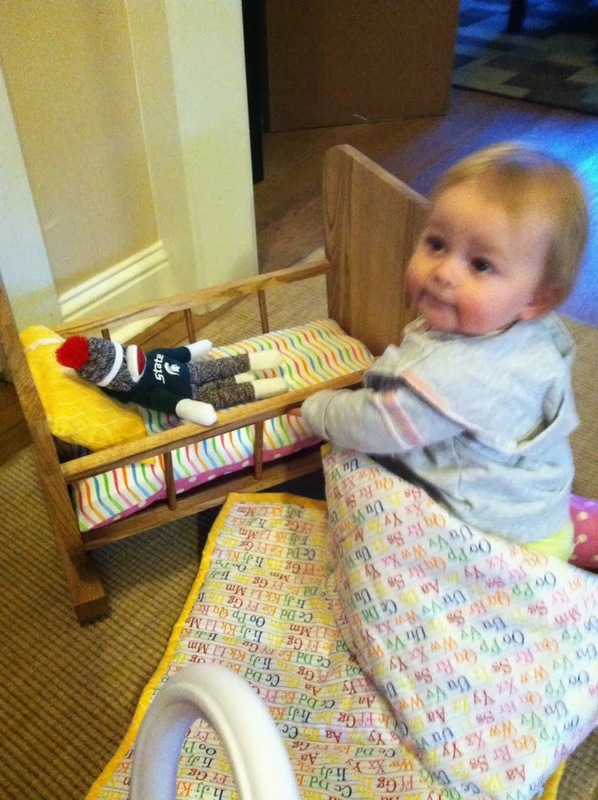 And here is Miss Annie with her sock monkey in the little cradle. I think Santa might bring her a little baby doll to sleep there, too. Now I'm going to see if I can turn this into a wall tree for my living room. 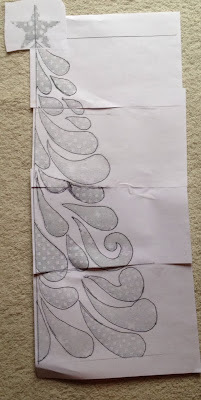 Will use batiks and just do raw edge - maybe not even sewing any of it down. 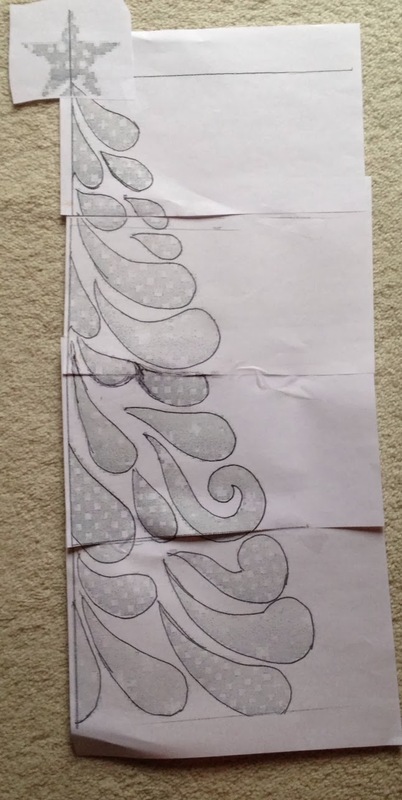 Or I could actually quilt close to the edge of each piece and that would take care of it, too. I've got a dental appointment on Tuesday that I would rather not have so will keep busy and concentrated on something fun. I am a white knuckle dental patient. Will be glad when the job is done! Oh I do not like the Dentist either and mine is one of the nicest guys around. I think it is too bad that we all hate going to them. lol I am glad you had a great time on Thanksgiving. I am serving Turkey Noodle Soup for dinner tonight. The End with the Turkey after this. I love your candles! But I think you're a little conservative on their age . . . we had identical ones when I was growing up in the 50's . . . and I have Christmas choir folks of the same vintage on my table now...2 larger ones and 3 small ones about the size of your Pilgrims. I totally agree about the dentist-- I am not a good patient. As for those candles - boy do they take me back. My mom had these so I'm thinking it was at least 50 years ago. We also had some that were little Christmas carolers -- boy I wish I had those now. Your Christmas project will be beautiful. Can't wait to see the finished product -- take care -- sending prayers for Tuesday - quick and painless. I really like the idea for your wall tree! I can't wait to see what you do!